Mercury attains a very favourable western elongation of almost 28 degrees from the Sun on 11 April, which means that the innermost planet is a morning object in the eastern sky before sunrise. 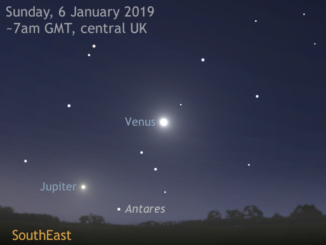 Antipodean skywatchers are in the enviable position of being able to see both Mercury and conspicuous planetary sibling Venus in a dark sky before the onset of astronomical twilight. For ten mornings starting 11 April (Australasian dates), Venus and Mercury lie within 5 degrees of each other and visible in the same field of view of 10× and lower magnification binoculars. Venus and Mercury are closest (4° 17′ apart) on 17 April. AN animation by Ade Ashford. It’s a popular misconception that Mercury can only be seen with the naked eye in twilight, either in the east shortly before sunrise when the innermost planet is close to a western elongation (as now), or in the west soon after sunset when the planet is near an eastern elongation. But if the circumstances are just right, it is possible to see Mercury in a truly dark sky before the first glimmer of astronomical dawn, or after astronomical dusk for eastern elongations. On Thursday, 11 April at 19:37 UT (8:37pm BST), Mercury attains a greatest elongation of 27.7 degrees west of the Sun. Hence the innermost planet is currently a morning object, visible in the east before sunrise. However, for observers at northern temperate latitudes such as the UK, the shallow angle of the morning ecliptic (see this story) means that Mercury presently rises just 25 minutes before the Sun in a sky too bright to view it. To get the best views of Mercury at this favourable elongation you need to live in the Southern Hemisphere. For example, an observer in Sydney, NSW currently sees the morning ecliptic at a steeply inclined angle to the eastern horizon, hence more of Mercury’s elongation from the Sun translates into height above the horizon. As seen from the Southern Hemisphere, then, the innermost planet currently rises much earlier than the Sun compared to the UK – so much so that antipodean skywatchers are in the enviable situation of being able to view Mercury in a dark sky since it rises more than two hours before the Sun. For the ten-day window starting 11 April, Mercury steadily brightens from magnitude +0.4 to +0.2. As seen from Australasia, Mercury lies about 15 degrees (or about two-thirds of an outstretched hand at arm’s length) above the eastern horizon an hour before sunrise. Please consult our interactive global Almanac to determine precise timings for your location. Not that there should be any doubt as to the identity of Mercury as seen from the Southern Hemisphere over the next ten days, but if any assistance is required then planetary sibling Venus acts as a very convenient celestial signpost. Between 11 and 21 April, the distance between Venus and Mercury is less than 5 degrees, so the pair are visible in the same field of view of 10× and lower magnification binoculars. Mercury crosses the constellation border of Aquarius into Pisces on 15 April, followed by Venus on 17 April (Australian dates). The planetary pair are also closest on the Australasian morning of 17 April when they are just 4° 17′ apart. The space environment around a planet plays a key role in determining what molecules exist in the atmosphere – and whether the planet is habitable for life. 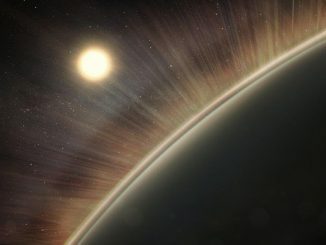 New research shows that Venus has an “electric wind” strong enough to remove the components of water from its upper atmosphere, which may have played a significant role in stripping Earth’s twin planet of its oceans. 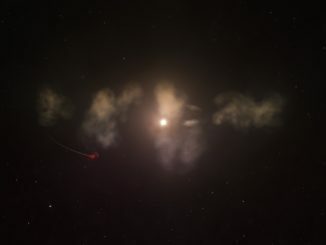 A team of U.S. astronomers studying the star RZ Piscium has found evidence suggesting its strange, unpredictable dimming episodes may be caused by vast orbiting clouds of gas and dust, the remains of one or more destroyed planets.